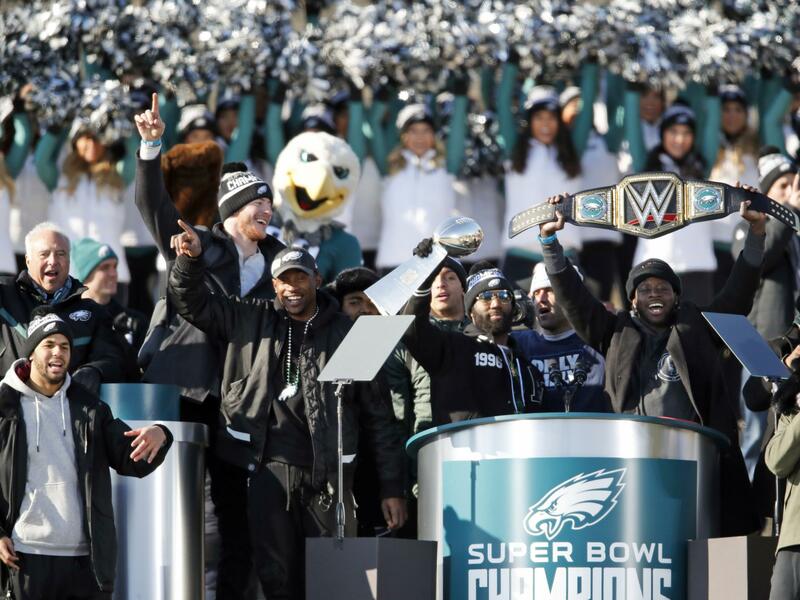 Philadelphia Eagles pictured celebrating their Super Bowl victory in a February parade, have been uninvited by President Trump to a celebration at the White House. President Trump has disinvited this year's Super Bowl winners, the Philadelphia Eagles, from a victory celebration at the White House Tuesday. The reason: the team won't promise that all players will stand with hand on heart for the national anthem. In a statement issued Monday, Trump provided the following explanation: "They disagree with their President because he insists that they proudly stand for the National Anthem, hand on heart, in honor of the great men and women of our military and the people of our country." Trump suggested the team had wanted to "send a smaller delegation" but on behalf of the fans, he said he found the idea offensive. "The 1,000 fans planning to attend the event deserve better," he wrote. The Eagles tweeted a general thanks to the fans for their support. The dramatic and slobberknocker 41-33 Super Bowl LII win was the first ever for the Philadelphia Eagles. As is routine, the White House invited the new champs for a D.C. victory lap. But, some players soon began suggesting they might not want to attend for political reasons. Trump's statement cited only the anthem issue — whether they would take a knee in protest during the song, for which the president has berated players. As NPR reported, just last month Trump praised a new policy by the NFL mandating that players either stand for the national anthem or remain out of sight in the locker room. He also wondered aloud whether those who choose to use the "Star Spangled Banner" as a moment to protest social injustice and police brutality against African Americans belonged on the field or in the country at all. "I don't think people should be staying in locker rooms, but still I think it's good," he said on Fox News. You have to stand, proudly, for the national anthem or you shouldn't be playing, you shouldn't be there, maybe you shouldn't be in the country." It's not the first time the president has pulled a take-backsies on a party celebration intended to honor some of the nation's top athletes. He also withdrew an invitation to the Golden State Warriors after their 2017 NBA championship, which the president blamed on player Stephen Curry. "Going to the White House is a considered a great honor for a championship team," Trump tweeted at the time. "Stephen Curry is hesitating,therefore invitation is withdrawn!" Despite the change of plans, Eagles fans — and fans of the national anthem — will have an opportunity to revel in "a different type of ceremony." According to Trump, this party will "honor our great country, pay tribute to the heroes who fight to protect it, and loudly and proudly play the National Anthem." Don't be late: "I will be there at 3:00 p.m. with the United States Marine Band and the United States Army Chorus to celebrate America," he said.